When handling insulation always wear long sleeved tops, gloves, eye protection and a face mask. is ALWAYS installed on the heated side of the wall or ceiling. This is to prevent moist air from getting into the wall cavity where if will condense and may promote mold and mildew growth. Mineral wool is made of natural basalt rock and recycled slag or man-made mineral fibres. The two main applications of mineral wool in residential construction are for thermal insulation and soundproofing. Coverage per bag depends on the thickness (R-value) of the batts. The insulation is sold in batts which can be cut easily with a utility knife. Thermal insulation. 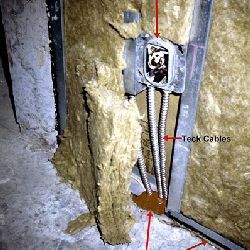 The insulation can be used in just about every place where insulation is required such as outside walls, floors above an unheated crawl space, basement walls, attic floors and knee-walls. It is easy to cut, is non-combustible, water resistant and does not promote the growth of mold or mildew. Fire and soundproofing insulation. Some mineral wool insulation products are specifically designed for soundproofing interior walls and floors. It is denser than the thermal insulation which will help in the absorption of acoustic waves. The higher density of the product makes a less than ideal insulation for preventing heat loss. When I built the recreation room in my basement I insulated the ceiling which really helped in cutting down the noise especially those coming from the furnace and bathroom areas.